Sometimes it’s not so much a matter of having a fancy pattern stitch to create an interesting and attractive finished garment. Sometimes a simple pattern stitch is just the solution – the key is the placement of that pattern stitch to show it to its best advantage. Such is the case with the Burning Leaves Shawl. 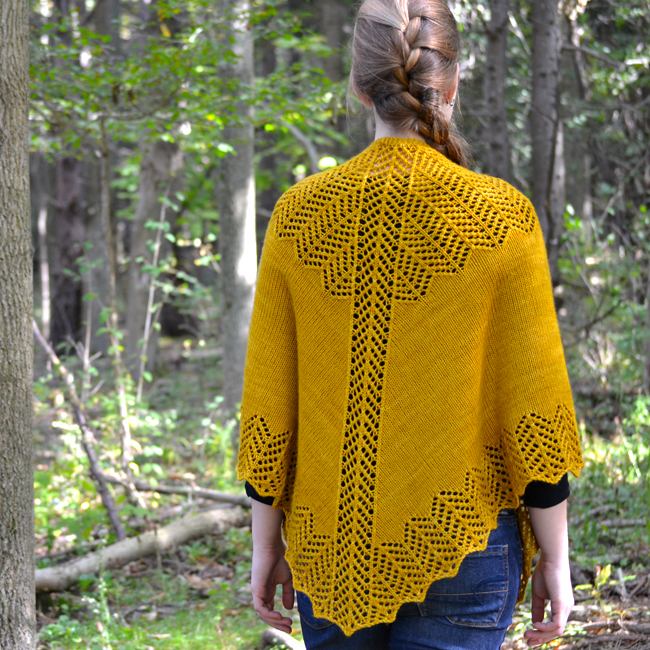 Inspired by the fiery colors of autumn, the Burning Leaves Shawl features a striking chevron pattern stitch that adorns the nape of the neck, then travels down a central panel to recur as an attractive border along the bottom edge. A versatile knit, Burning Leaves may be worked in three sizes – Small, Medium and Large. The stockinette field between the border and lace insert gets progressively larger with each successive size worked. My Medium shawl sample (pictured) was knit using three 4 oz/113 gr (250 yds/229 m) skeins of Dream In Color Classy (100% superwash merino wool) in Amber Glass. The Small shawl requires three skeins as well, while the Large shawl requires four skeins. Amber Glass is a stunning colorway if you take any kind of fancy to gold as it possesses a superb depth of color. So take a stroll and enjoy the fall colors, as fleeting as they are. Then, return to your cozy chair and knit a lovely shawl to remember them by. 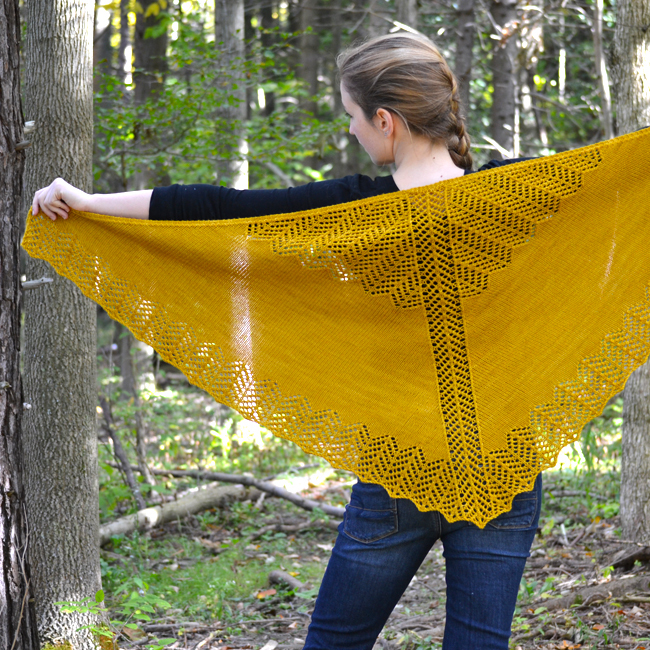 Full pattern details for the Burning Leaves Shawl can be found here.